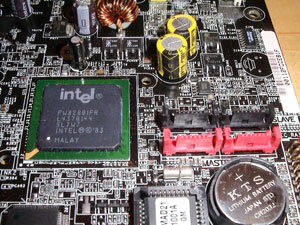 When Intel introduced its 900 chipset family in mid 2004, support for DDR2 memory and the new PCI-Express interface for graphics and peripherals got a lot of attention. Another, somewhat overlooked, new feature available with 900 chipset based motherboards is MatrixRAID, implemented by virtue of the also new ICH6-R.
Southbridge integrated RAID is a big advantage as there is no need for a PCI based RAID controller any more. It’s also faster - Intel’s ICH5-R and ICH6-R offer RAID through native SATA channels with a maximum bandwidth of 150 MB/sec each. The PCI bus however is only good for 133 MB/sec which is barely enough for the transfer rates of high-end hard disks running in RAID 0. The earlier ICH5-R coupled with the older 8x5 chipset of course already provided RAID 0 and RAID 1. However, the ICH6-R takes RAID functionality one step further, with MatrixRAID. This allows running both a RAID 0 and RAID 1 volume with only 2 hard disks. Previously, running two arrays was only possible with 4 physical hard disks. We will examine in this article how a Matrix RAID system is set up, how it performs and how it functions in the event of a hard disk failure. RAID 0 leverages the read/write capabilities of two or more hard drives working in unison to maximize the storage performance of a computer system. Data in a RAID 0 volume is arranged into blocks that are interleaved among the disks so that reads and writes can be performed in parallel. This technique, known as "striping", is the fastest of all of the RAID levels, especially for reading and writing large sequential files. Real world usage models where RAID 0 can be of particular benefit include loading large files into an image editing application such as Adobe Photoshop, saving large movie files in a video editing application such as Adobe Premiere, or creating CD or DVD images with CD/DVD authoring software. No redundancy information is stored in a RAID 0 volume. This means that if one hard drive fails, all data in the array, on both drives, is lost. A RAID 1 array contains two hard disks where the data between the two is mirrored in real time - both drives contain exactly the same information. Since all of the data is duplicated, the operating system treats the usable space of a RAID 1 array as the maximum size of one hard drive in the array. For example, two 40 GB hard drives in a RAID 1 array will appear as a single 40 GB hard drive to the operating system. The primary benefit of RAID 1 mirroring is that it provides good data reliability in the case of a single disk failure. When one disk drive fails, in most cases all data is immediately available from the other without any impact to the data integrity. In the case of a disk failure, the computer system will remain fully operational. The performance of a RAID 1 array is about that of a single disk. 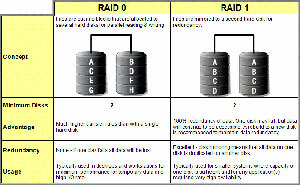 Certain combinations of RAID 0 and RAID 1 are already possible. RAID10 or RAID0+1 use different combinations of striping and mirroring to provide one volume. Either option requires four physical hard disks. However, note that this is not exactly what is provided by MatrixRAID. MatrixRAID provides two separate volumes, one a RAID 0 array and one a RAID 1 array. Again, you can achieve this with other RAID controllers, but you would need four hard drives. Two would be striped for RAID 0 and the other two would be mirrored for RAID 1. Previously this has been unattractive for desktop users due to the cost, space, heat and noise of the required four hard drives. The "big deal" about MatrixRAID is that it only requires two hard drives in total for both arrays. A user can enjoy the performance of RAID 0 and the security of RAID 1 for half the cost and half the space required before. HOW DOES MATRIX RAID WORK AND WHAT ARE THE BENEFITS? With the ICH6-R (the R denotes RAID capability) it is now possible to run RAID 0 and RAID 1 with only two physical hard disks. It’s up to the individual user how to take advantage of these arrays. By common sense all important data will be put on the RAID 1 volume, protected by the redundancy of this array. The RAID 0 array could then for example be used as working space for large temporary files. Which of the two arrays holds the Operating System and applications is more a matter of individual taste. If they are installed on the RAID 1 array the system remains operational in case of a hard disk failure, but loading them will be a little slower than running from the RAID 0 array. If installed on the RAID 0 array they are loading faster, but in case one of the 2 hard disks of the array fails, the system is immediately unusable until the disk is replaced and the system reinstalled. All that's required for MatrixRAID are an ICH6-R equipped motherboard, 2 SATA hard disks and Intel’s Application Accelerator RAID Edition (IAA) software. You might wonder why MatrixRAID is such a big deal. Well, if this were so easy then why haven’t we seen a similar two-disk solution from the RAID greats like Promise Technology, Highpoint, and Silicon Image. They have for many years provided only their expensive four-channel RAID controllers, which only allowed running RAID 0 and RAID 1 together if you provide four hard disks. For the safety paranoid user the ICH6-R offers one additional feature: A third disk can be assigned as a spare member of the RAID 1 array. The spare disk lays dormant in waiting until a disk in the RAID 1 array fails. It then kicks in and starts automatically, without user intervention, rebuilding the RAID 1 volume. We will later demonstrate how this works.